Keeping your Toyota Camry operating at its peak performance is important. It becomes even more important when we start talking about your brakes. Have squeaky brakes? Pedal response feeling slow? Replace them by following these steps. 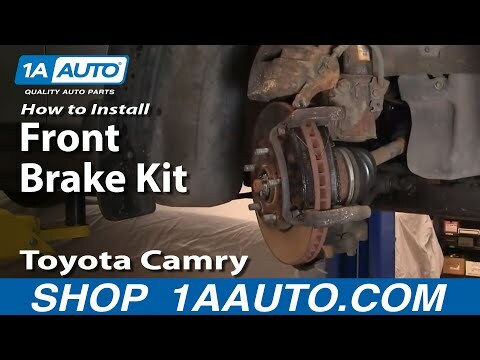 Replacing the Toyota Camry brake pads doesn’t have to be difficult if you follow these steps. First, park your vehicle on flat surface, engage the parking brake and then remove the tire on the side of the car you want to replace the brakes. You can remove the tire by loosening up the lug nuts and then jacking the car up. Next, insert jack stands under the tire you are replacing to make sure the car doesn’t fall. Then, locate the two bolts on the back of the caliper. Remove then and the caliper should come loose. Move and hang the caliper in such a way that you don’t pinch the brake line. It is often advised to use a coat hanger or wire to do so. With the caliper off, take a look at your rotors. If the car vibrates when braking these rotors will need to be replaced. If not, then they may be ok. You can determine how good they are by measuring the thickness and comparing that to Toyota’s specifications by using a special tool. Looking back at where the caliper came from, you should see your brake pads. They are held in with a set clips or otherwise. Remove this clip with pliers (pushing the clips together) and pull the brake pads out. Replace them with new ones. In order to put the caliper back, it is necessary to compress it. This can be done with using the old brake pad and a c-clamp. There are special tools to do this as well. Once the caliper is compressed, reinstall it by inserting the bolts back on. Next, put the tire back on and lower the vehicle. Lastly, step into the vehicle and depress the brakes. They should seem “soft.” This is expected, a few good pushes on it and they should be strong again. Congrats! By following these steps you should have been able to change your brake pads.